Unexpected galactic oddities can humble researchers and armchair astronomers alike by sidestepping cosmic predictions. Luckily, they’re happy to teach us what they know. We just have to learn to listen. Nearby Triangulum II has astounded Caltech researchers with its super speedy stars. Our tiny galactic neighbor has only about 1,000 of them, compared to our haul of at least 100 billion. But Triangulum II has a tremendous amount of hidden mass. Mauna Kea’s large Keck telescopes clocked six of these stars going much faster than expected, given the galaxy’s anemic physique. Thanks to these speeding stars, researchers were able to calculate Triangulum II’s gravitational powers and its overall mass. They found the highest concentration of dark matter in any galaxy studied so far. However, French researchers from the University of Strasbourg contend that the gravitational tug of neighboring galaxies is what’s flinging the stars around. If it is full of densely packed dark matter, the galaxy offers a perfect opportunity to directly glimpse the mysterious substance that contributes 24 percent of the universe’s mass. A quirk of dark matter particles—if they exist—is that they apparently annihilate each other upon contact, releasing a shower of gamma rays. Since Triangulum II is a dead galaxy, these signals should be clear, with no interference from the many cosmic energy sources present in livelier sectors. US and Hungarian astronomers recently stumbled upon a structure so insanely large that it shouldn’t exist: a ring of galaxies that is five billion light-years wide. This mind-boggling menagerie stretches across an area of sky that is 70 times greater than the width of a full Moon. An indication of the ring’s size comes from the proximity of seven observed gamma-ray bursts (GRBs), the most violent events in the universe. GRBs occur when ‘roided-out stars go hypernova and collapse into black holes. Since the seven bursts in question were at such similar distances, astronomers concluded that a gargantuan structure of linked galactic hot spots was present. Of course, it might be sheer coincidence, but researchers claim the odds of that are an astounding 20,000 to 1. The ring violates our cosmological models that prohibit the accumulation of such gobs and limit large things to approximately 1.2 billion light-years in size. These models suggest a relatively uniform universe—a supposition bolstered by baby pictures snapped shortly after the big bang belched the universe into being. So, if it truly exists, why is the ring so darn big? No one knows, though dark matter may be implicated in bringing everything together. Astronomers have combined the powers of the Hubble and Spitzer space telescopes to view the dimmest galaxy ever. 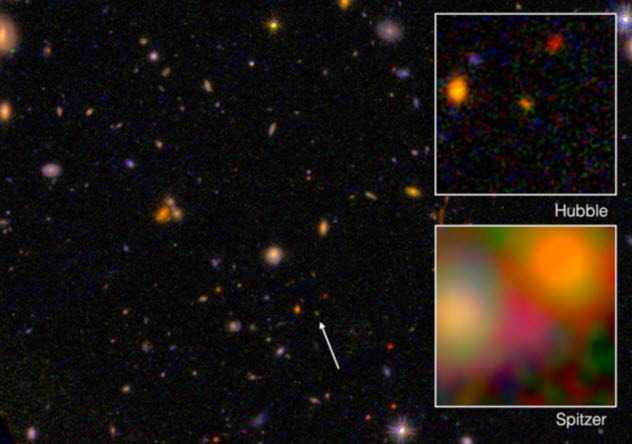 They searched back in time to just 400 million years after the big bang to see this new variety of ultrafaint galaxy whose ilk had so far evaded detection. The galaxy is named Tayna, which means “firstborn” in the Aymara tongue native to South America’s Andes and Altiplano. It may seem to be the loneliest little galaxy ever, but it’s one of 22 similarly natal siblings perched at almost the observable edge of existence. Spotting Tayna clear across the cosmos required two of our finest space telescopes and a massive contribution from the galaxy cluster MACS J0416.1-2403 that is four billion light-years away. With its mass of one quadrillion Suns, the cluster magnified the light streaming around it and allowed us a glimpse of Tayna in all its red, pixelated glory. The James Webb Space Telescope, set for a 2018 launch, will reveal Tayna and its embryonic kin in much greater detail and give us a view of the first galaxies. We wish that we could see Tanya in adulthood. For all its puniness, it boasted a high rate of star formation and most likely grew into a respectable galaxy. Astronomers aren’t sure how galaxies are born. Do hydrogen and other assorted gases spiral in toward massive clumps of dark matter that serve as gravitational nests? 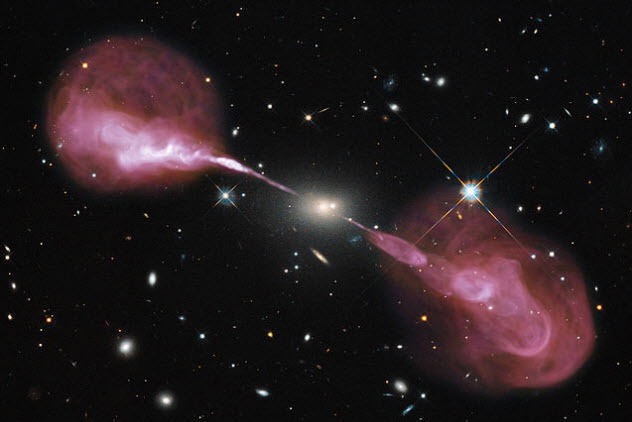 Or are galaxies fed by a gaseous intergalactic pipeline, like some kind of ethereal mama bird? The former is too slow to match observed data, and the latter has never been observed. Until now. Caltech researchers used their own Cosmic Web Imager to spot a protogalactic disk (baby galaxy) 10 billion light-years away that was being breast-fed a nourishing hydrogen formula by an expansive strand of gas. The strand is part of a much larger, interconnected cosmic web of unclaimed stellar ingredients. Thanks to the fortuitous placement of two quasars, the active strand appeared much brighter than the rest of the network, sticking out like a flaming thumb. It turns out that the gassy strand is flowing into a huge disk, which brilliantly reflected the light from its quasar neighbors. 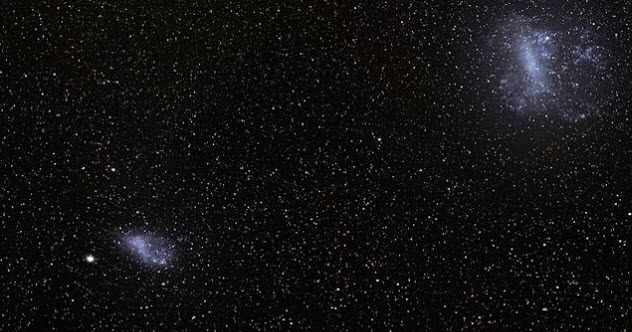 The Large Magellanic Cloud (LMC) and its malnourished companion, the Small Magellanic Cloud (SMC), are our nearest neighbors at distances of 160,000 and 200,000 light-years, respectively. The most prominent of the dwarf galaxies circling the Milky Way’s drain, they are visible unaided in the night sky of the southern hemisphere. But there are odd happenings in the LMC. In the ominously dubbed Tarantula Nebula, astronomers are puzzled by the discovery of a fruitful star hatchery—one that would cast shadows on Earth if it were well over 1,000 light-years away. Furthermore, of the 5,900 giant and supergiant stars analyzed in the LMC, 5 percent appear to have stowed away from distant shores. They trace irregular orbits and aren’t even made of the right material, appearing to have been starved of heavier elements like iron and calcium. Astronomers realized that the LMC was taking its smaller sibling’s stars. Chemically, the SMC’s stellar residents match those pilfered by the LMC. The term “cosmic highway robber” can also explain the unusually fertile Tarantula Nebula. The greedy LMC is also siphoning gas, which flies in at such speed that it “ignites” upon contacting the larger galaxy’s residual reserves. At the center of Hercules A (aka 3C 348) lurks a behemoth black hole with the mass of 2.5 billion Suns! It’s 1,000 times more massive than the Milky Way’s ample black hole and generates two unreal jets of plasma that obscure the much smaller host galaxy. Extending 1.5 million light-years into space, the jets overshadow many other galaxies as well—especially the Milky Way, which is about 15 times less impressive. The energies involved are mind-boggling: The central black hole outputs one billion times more power than our Sun at radio wavelengths. That’s enough to make Hercules A one of the brightest radio sources observed. The pinkish-red beam is an amalgamation of plasma, subatomic particles, and magnetic fields propelled to relativistic speed (near that of light). The ruffled outer edges suggest many previous outbursts. Sadly, this is invisible to the naked eye. The radio lobes are only apparent in composite images, which are produced by a combination of visible light data from Hubble’s Wide Field Camera 3 and radio observations from the Karl G. Jansky Very Large Array. Our galaxy is no spring chicken. As a matter of fact, it’s almost as old as the universe itself. Within the Milky Way’s central bulge, astronomers have discovered a cluster of 70 white dwarfs, which are dense star carcasses with the Sun’s mass squeezed into an Earth-sized package. The historic dwarfs were extracted from a panorama of the Milky Way’s overpopulated heart, which is located about 25,000 light-years from Earth in what NASA has called a “cosmic archaeological dig.” Among those seemingly countless stars, researchers spied the 12-billion-year-old embers that once shone brightly and suffered relatively tame deaths. They’re now nothing more than astronomical relics, yet they show us the history of the Milky Way. It’s believed that these white dwarfs seeded our galaxy—a feat that took less than two billion years. Hundreds of billions of successive stars followed their example to create the Milky Way, a spiral galaxy that is 100,000 light-years wide. NASA’s space telescope WISE (Wide-field Infrared Survey Explorer) has found the brightest galaxy yet, glowing with the fury of more than 300 trillion Suns. The photons from galaxy WISE J224607.57-052635.0 traveled 12.5 billion years to bring us their message, supplying us with an image of the universe at one-tenth of its current age. 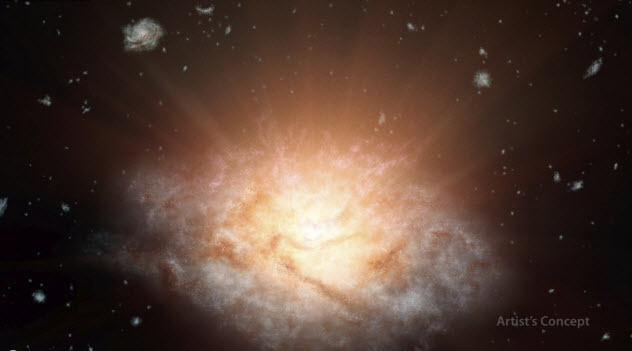 The galaxy is so bright that it even hurts to look at the artist’s rendition. But the effect is not due to starlight. Instead, the luminosity is attributed to a black hole so massive that it bends our understanding of physics. It’s a total surprise that the early universe could harbor such a cosmic fatty. Black holes are limited in their feeding, and there wasn’t enough time for so much to spiral into its maw. 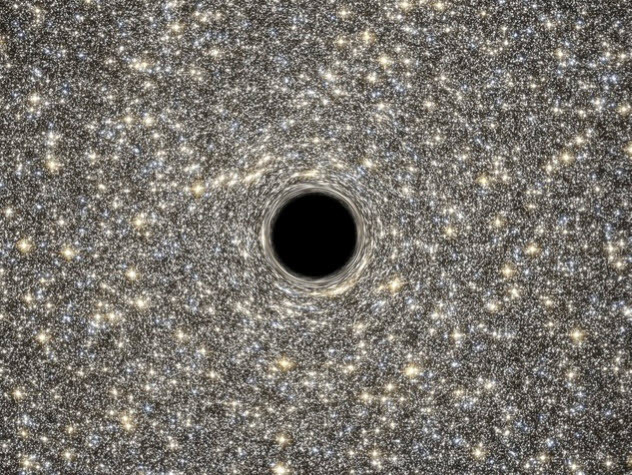 This black hole was birthed large or somehow bypassed the feeding limit several times to have attained its observed mass. Either way, it piggishly gorged itself to the point of spewing. Its highly energetic upchuck smashes into the surrounding cocoon of dust, producing its dazzling aura. So that breathtaking image above is the result of a black hole’s violent projectile vomit. But it’s not alone in its brilliance. With infrared vision, WISE has discovered a handful of other ultrabright galaxies whose visible light is obscured by space dust. Tiny M60-UCD1 might change our understanding of black holes and dwarf galaxies. It’s only 300 light-years wide, which is 0.2 percent of the size of the Milky Way. But don’t laugh yet because it’s packing a black hole with a mass of 21 million Suns. Compare that to the much larger Milky Way’s black hole, which has a mass of four million Suns. Until recently, it was assumed that galaxy size and black hole size were commensurate. So this discovery throws a monkey wrench into current models and suggests that black holes are much more common than we dared to believe. This happened because M60-UCD1 wasn’t always a runt. University of Utah astronomers believe that it was once a mighty specimen 10 billion stars strong. But one day, it strayed too close to an even mightier neighbor and was robbed of most of its stars. It held on to about 140 million stars. But that was not enough for M60-UCD1 to avoid the distinction of being the smallest galaxy ever discovered with a supermassive black hole. It also begs the question: Do dwarf galaxies form by a lazy congregation of stars, or are they all cosmic shreds? The one upside to living in a depleted galaxy, however, is the night sky. With well over 100 million stars packed together like sardines, the “night” view is a magnificent wash of light. At over 13.2 billion years old, galaxy EGS8p7 is so ancient that we shouldn’t be able to see it. During the post–big bang hangover, the universe was a hot jumble of protons and electrons. As it cooled, the particles combined into neutral hydrogen. In this case, neutral is bad: It’s opaque and obscures the early universe from our peeping telescopes. Thankfully, when galaxies and other energetic things came into being, they reionized the gas, which brought light to the universe by dispelling the fog. However, this occurred around one billion years ago, so EGS8p7 should be too distant to be visible. Strangely enough, astronomers were still able to pick out its Lyman-alpha line, which is like a galactic bar code. It’s produced when unruly young stars blast UV light into the surrounding gas and leave a thermal signature. This signature was detected by the Keck Observatory’s MOSFIRE spectrometer, even though EGS8p7’s line should have been hidden behind the early universe’s hydrogen shroud. Astronomers aren’t sure how EGS8p7 pulled off its appearing trick. But maybe it was so large and its stars so potent that it reionized an enormous patch of universe much earlier than other galaxies. Andromeda (M31), our closest neighbor of substance, is surrounded by a big fat halo. Twice the size of our Milky Way, this monstrous galaxy is already 200,000 light-years across, and its gassy mane expands that by about one million light-years. Acting as beacons, a supporting cast of far-off quasars gave astronomers an exploratory assist. The diminished UV light reaching Hubble from these jet-spewing monsters gave researchers an idea of how much faint, diffuse crud must envelop Andromeda to produce such an effect. Sequestering half of its galaxy’s gas, the halo is a vast stellar reservoir supplying the raw ingredients for—and controlling—star formation. It’s also rich in the heavier elements produced and flung to the outskirts by Andromeda’s many past supernovas. Sadly, the halo is invisible to our human eyes. Had we been optically blessed, we’d enjoy a truly majestic night sky. 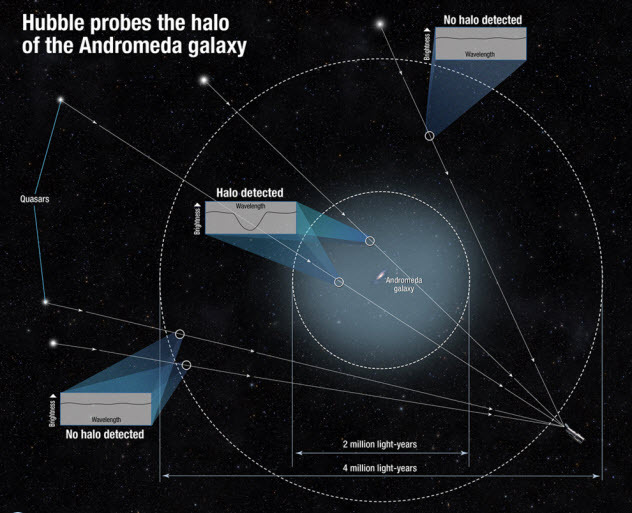 Andromeda’s halo would occupy a patch 100 times the diameter of the full Moon. Alternately, you can hold two basketballs at arm’s length to personally experience the immensity produced by an object residing 2.5 million light-years away.